One thing that never fails to amaze me with True Crime, is the apparent schizophrenia of some of its adherents. True Crime is about a search for truth, right? It's also about calling out criminals and criminality, right? It's about a fight for justice, right? Not quite, for some it's also about PR. For some it's also about shaming those narratives you don't agree with. It's about cheerleading your show pony, and the one who cheers the loudest wins [who cares whether it's dishonest, disingenuous, deceitful or spiteful]. And so, without further ado, let me introduce one of Shakedown's most faithful reviewers: C.T. 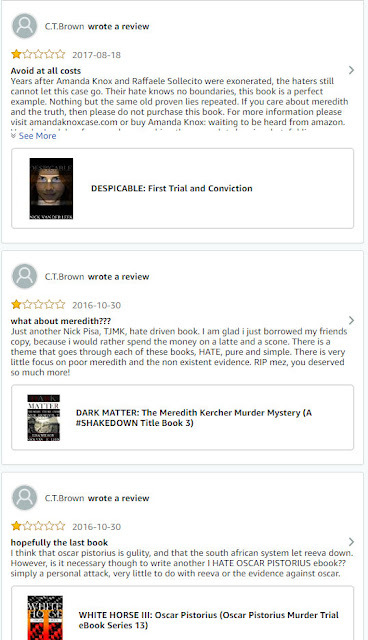 Brown who has reviews on both Amazon.com and Amazon.co.uk. 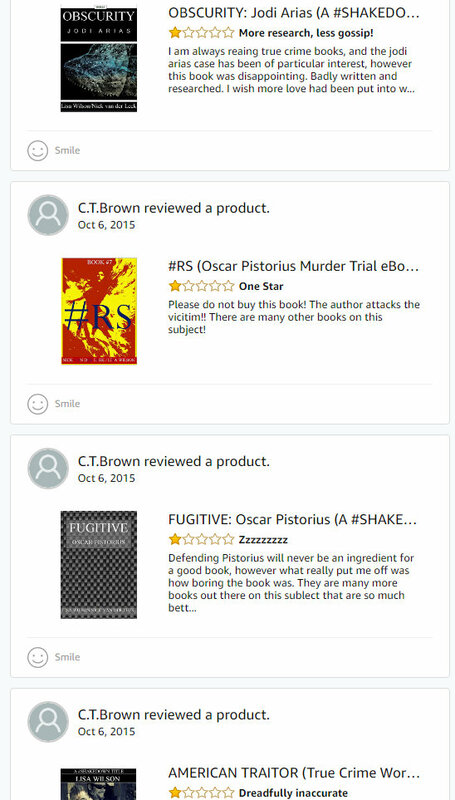 Brown, who describes herself as a nurse based in the UK, and who places a link on her profile to a pro Knox site, has left no less than 8 reviews on her .com profile [all 1 star of course] and another 6 on her .uk profile. That's a total of 14 reviews. "The author seems to be obsessed with Amanda Knox." 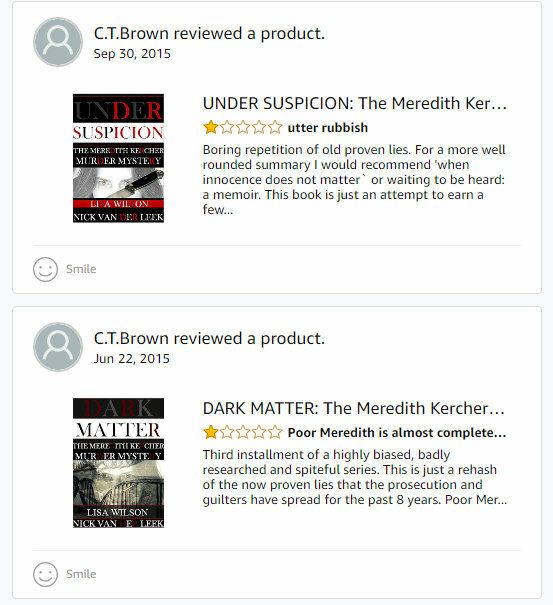 "...a highly biased, badly researched and spiteful series." "Tip: before writing a book read the evidence......just a thought ;)"
"...what really put me off was how boring the book was..."
"Please do not buy this book!" "The worst part though was the dry and boring writing. Seriously dull!" "There is a theme that goes through all of these books, HATE pure and simple." "...their hate knows no boundaries..."
And so it goes on. As far as I can tell not one of C.T. 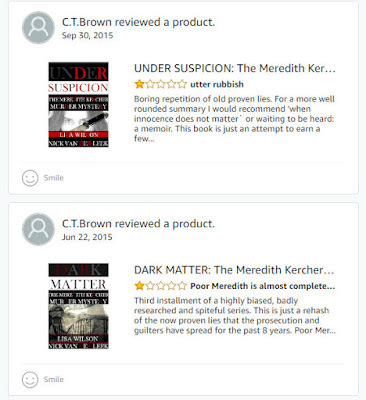 Brown's reviews are verified purchases, and not one discusses a single aspect of the evidentiary burden. You have a book citing hundreds of aspects of evidence and also dissecting witness testimonies, and yet the reviewer never settles down to contest, argue or counter any in its own terms. It does beg the question, given Brown's unadulterated dedication to discrediting some while endorsing others, is Brown being paid to troll, or does Brown do it on her own dime?